« C is for Color! Startitis #1, the next hourglass, out of 3 year old Rhinebeck Alpaca. This the one I started twice due to supposed twisting. 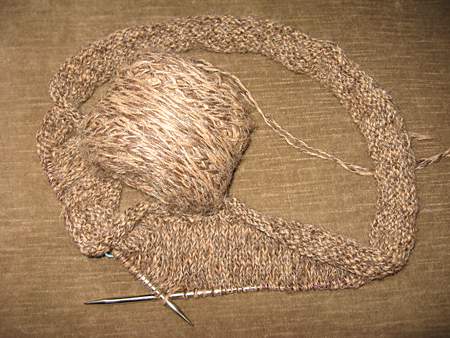 Damn thing still twirls on the needles but I know it straightens out. 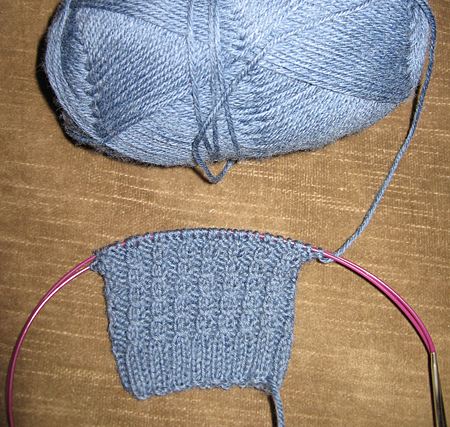 It’s mindless boring TV knitting, and yet I can’t seem to get further than this. Startitis #2, a sock. A plain old sock out of Knitpicks Essential. I needed a subway/office project. No pattern being followed, just some cute twisty ribs. Startitis #3, started last night. I’ve had this Elann Pure Alpaca forever. ForEVAH. I kept changing my mind what to do with it, and finally decided to use half or less (I have 20 of these suckers) for the cute Lush and Lacy Cardigan that everyone is queueing on Ravelry. It’ll be a cute spring sweater – but I can’t help feeling a little bit like I am over these muted colors and wish it was a bright happy green. This sage/asparagus/avocado is so 5 years ago. But whatever. It’ll be cute. If it gets beyond this stage. Man, just started items are really boring to look at. I hope after the nightmare that is my 56 page magazine supplement is done today, one of these items might grow a bit. Which one will it be? Posted by jackie blue on Friday, February 15th, 2008 at 1:13 pm. That Lush and Lacy is very, very cute. I’d vote for that. I hope your work is all done! You could dye the alpaca. And I vote for the Lush & Lacy too, if only because it’s not something you already have. My sister is right, lush and lacy is a great sweater. If you like the sweater and yarn but not the color, you could have dye fun this weekend?!?! Hi, Well you know you’re not alone. But you’ll have to discipline yourself to get these done. I’m in the process of learning to do that. I’m constantly talking to myself,in my mind, about getting back to these projects and making plans on times and days and possibly places. But the final thing is you’ll just have to DO IT. 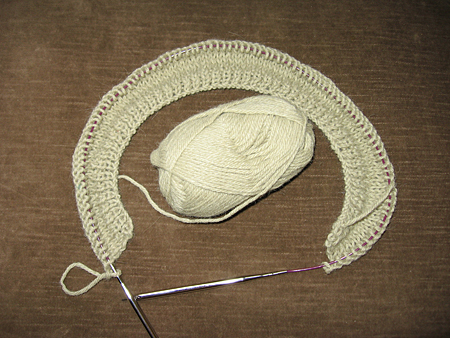 I looove the circular needle. I can see my straights as decorations or ocasional use. But I just looove my circulars. I carry projects everywhere I go whether I get to do it or not. It depends on what I’m doing. I may not be allowed time to knit or crochet at all. But these needles are the way to go for me. So plan and you’ll do it. Its all just sloppy love isn’t it.